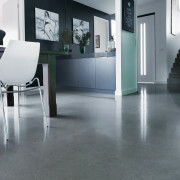 One flooring system or option currently gaining popularity is polished concrete. Concrete is a durable material and thus meets an important sustainable-design criterion. In addition, the polishing process enhances concrete natural appeal. These attributes have contributed to the increase use of polished concrete in homes, retail, restaurants, factories, offices and other settings. Polished concrete, because it does not involve a coating, it’s a breathable system-one that allows transmission of water vapour and thus is not subject to failure due to moisture migration from below. When properly installed and maintained, polished concrete can last the life of the structure, avoiding the time and labour of installing subsequent flooring systems. Polished concrete can be used in almost any interior area. In exterior setting, however, acid rain has a tendency to prematurely etch the surface and cause premature deterioration of the shine. A true grinding and polishing system requires a process consisting of five to twelve steps depending on the desired shine and exposure of aggregate. Grinding and polishing techniques are divided into two categories . Those employing metal bonded diamond(16- 120grit) that are used in the initial grinding phase and resin bonded diamond segments (50-300grit) that are used in the latter polishing phase. The initial grind with metal bonds removes high spots imperfections and contaminants, this stage may require up to three stages, but will consume 60-65% of the total time required to complete the job. Resin bonded diamonds used following application of the grout/ densifer or hardener to polish and remove the scratch pattern created by the initial grinding process. A final step involves application of a penetrating sealer and a high speed burnisher is applied to buff the surface for a final gloss shine that also helps resist further staining. With the vast amount of flooring options available today, architects, specifiers and owners are well advised to consider all available options to meet the needs of the structure and its occupants. Issues such as durability, safety, maintenance costs, replacement needs, and environmental profile should be weighed up in determining the ideal floor for the given setting. Polished concrete can provide an answer to many of these needs. Effective choices regarding flooring systems can deliver safe, environmentally friendly solutions that are cost effective and contribute to the highly coveted goal of sustainability in design and construction.